While the sawmill and the company store were the dominating structures in Swandale, other interesting structures have been recorded on film and are presented here. 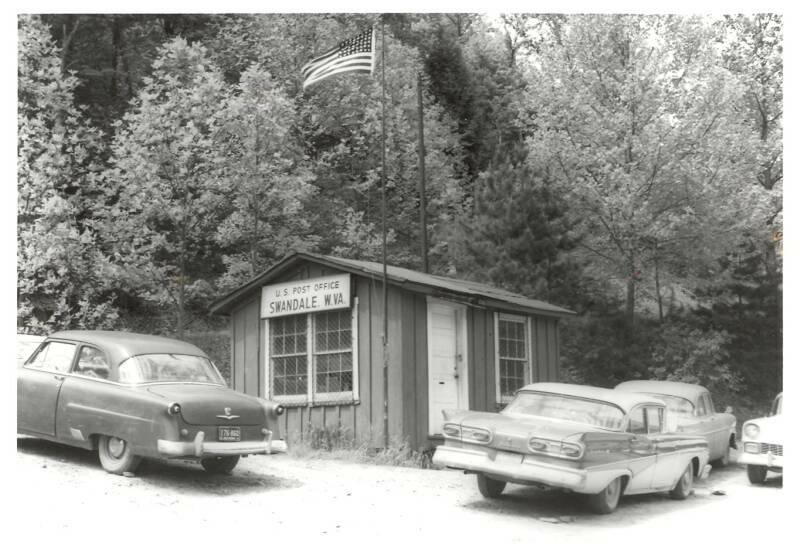 For most of the time the US Post Office was in the back of the Swandale company store. But this interesting little building became the post office sometime in the late 1950's. The newest car in the picture is a 1958 Ford. 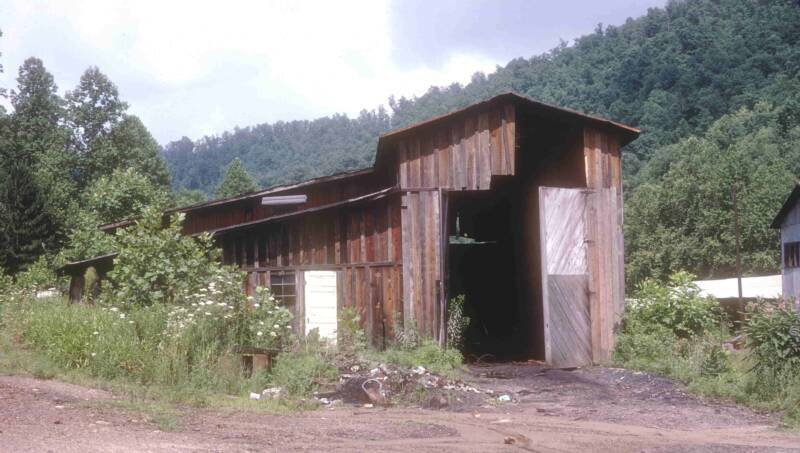 This structure was located directly behind the feed storage building. The structure was a barber shop before becoming the Post Office. 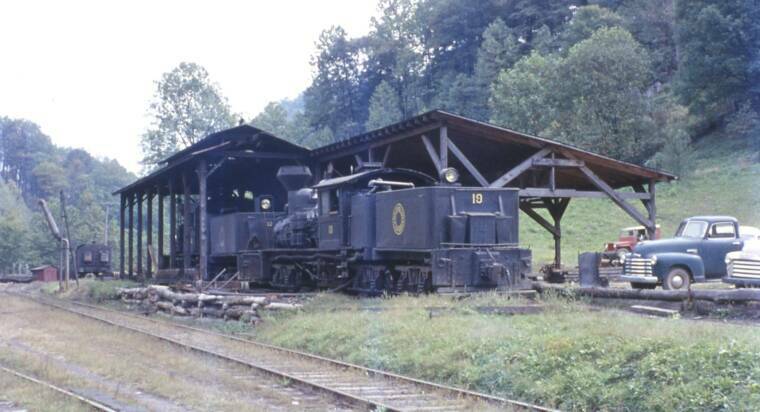 The John Krause photo to the left dated 1962 also shows the engine house fully enclosed. Thanks to Dave Marquis for this clear color photo (above) of the Swandale shop, now a service facility for fork lifts rather than an engine house. The opposite side of the shop and its location are clear in this photo, also by David Marquis. ERC&L Plymouth diesel #20 is sitting in the middle of the photo, seemingly on the BC&G main. 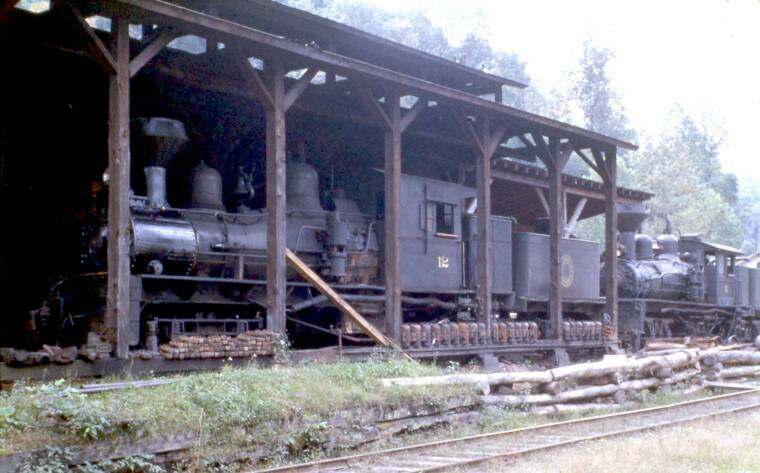 There was a VERY modest engine house in Swandale to accommodate servicing the ERC&L geared logging engines. This photos from page 58 of Warden's BC&G book shows the structure. It was an open air affair with a cupola on the roof to allow smoke to vent when an engine was fired up inside. 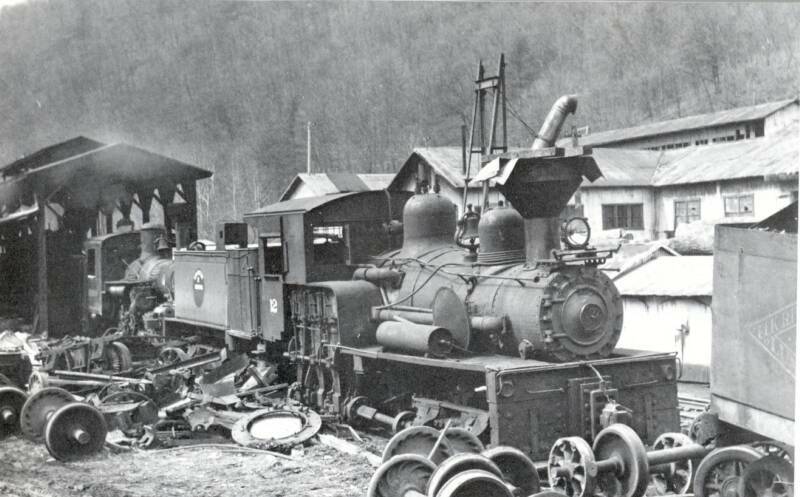 There was a pit in the ground inside the enginehouse to facilitate servicing the underside of the locomotives. "Sometime in the early 1960's, after the new company took over, they tore down all the docks that ran the length of the lumber yard and brought in giant fork lifts to load and unload lumber. Since steam was gone they removed the cupola on the shop. Then they sided up the shop and put the big doors on it so they could work on the big fork lifts in out of the weather. 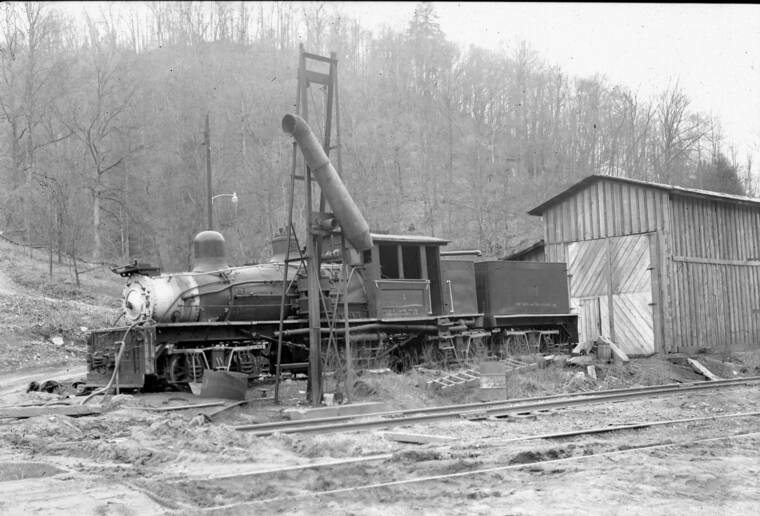 They would drive them over the same pit that had been used in the steam days to work on the Shays and Climaxes." "My great uncle, Francis Murphy, served for many years as the part-time barber there, cutting hair one or more evenings during the week. My dad would take me there to get my hair cut and it was always a great experience to be there among the men of the community. Uncle Francis was a great fan of baseball and the industrial league that several of his family played on. The haircut you got, and how long it took, depended in large part on how exciting the sports conversations became. One interesting thing in the barber shop was a banjo-style steering wheel hanging on a hook or nail on the wall. I don't remember when it happened but the Gray familiy was traveling, I believe, from Clay back to Swandale. There was a section of the road near the foot of Nichols Mountain that had partially slipped away. Their car went over the hill and rolled many feet down the mountain into the creek. As I remember the story, all escaped injury but the only part of the car not damaged was that steering wheel. I think it was a 1938 Dodge. The steering wheel was the subject of alot of conversation. Back then, the barber shop was truly a man thing - I miss those days". Phil Bonzon developed this sketch of the Swandale enginehouse to aid in the construction of a model of the structure for his layout. 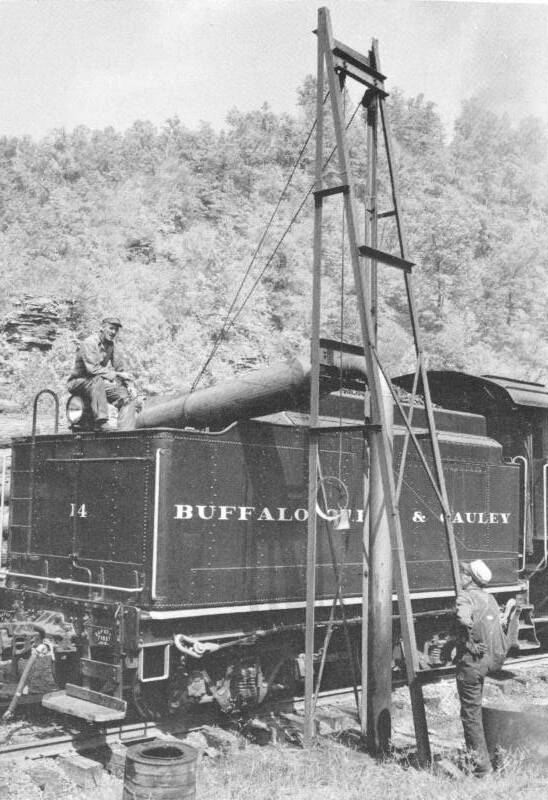 At Swandale, as well as several other sites along the track, the BC&G constructed these unique water plugs. They were fed from water tanks on the hillsides near the track. 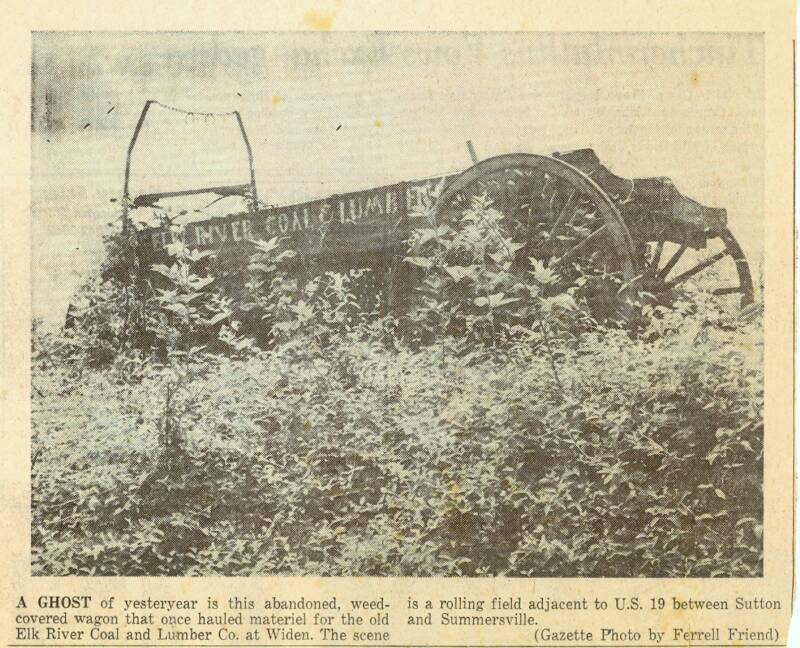 This photo is from page 59 of the Warden book and shows Ab Wilson on the tender and Sam Burkhammer on the ground. To the right is the same water plug in July 1969 in a photo by Richard Bradley. Patsy Baughman has provided this very early picture from Swandale of the horse barn that stood on the road that went into the hills on the opposite side of the tracks from the sawmill. It is estimated the photo was taken around 1922. The road and this structure are visible in the panoramic photo on the lead page of this section. 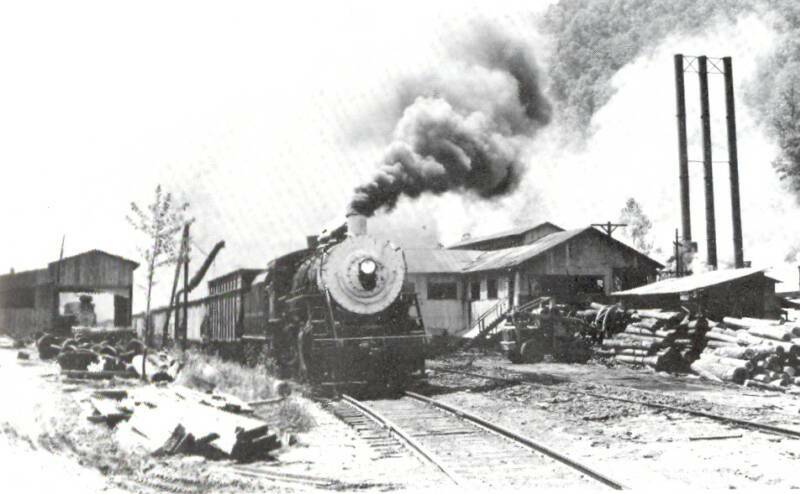 The horses were used to pull carts on the lumber docks at the mill as well as for pulling the delivery wagon and for regular 'transportation' into and out of Swandale, as was done by Mr. Crockett, the blacksmith. Patsy and her sister provide this additional information about the photo. 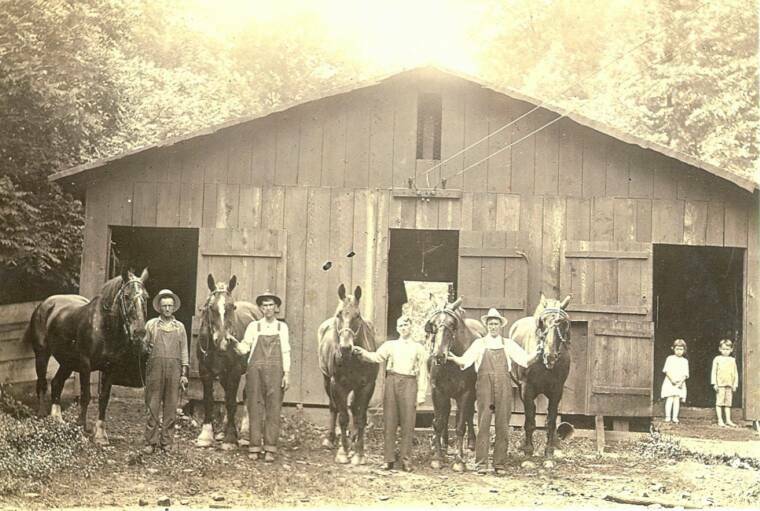 The men are, left to right: "Dolf"Trman, Sam Gray, Nelson W. Spencer (Patsy Baughman's father), and Marion Ashbury (who drove the team of horses to deliver coal and groceries). The two children in the doorway are Patsy's sister, Nancy Spencer, and her brother, Foster Spencer. 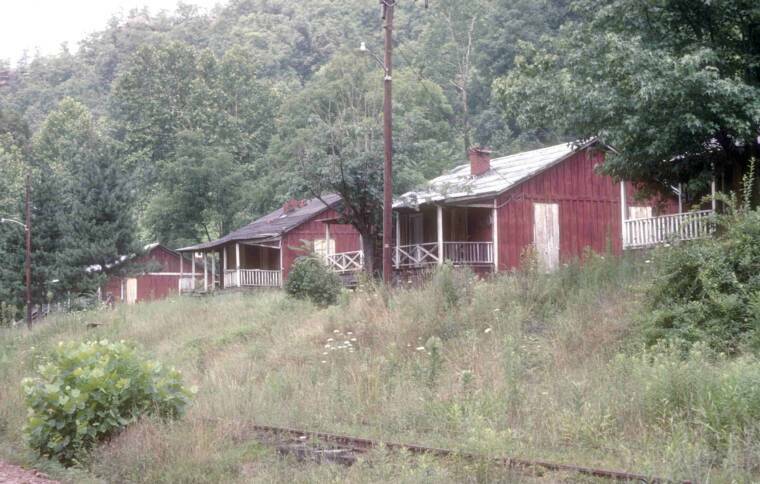 David Marquis took these photos of houses at Swandale before they were torn down. Curiously, one house has the criss-crossed porch railing design usually identified with the company houses at Widen. Most Swandale houses had vertical spindles. This photo (below left) of the Community Building taken in 1967 was provided by Elvin Frame. It is the only one I've seen that shows this side of the structure. 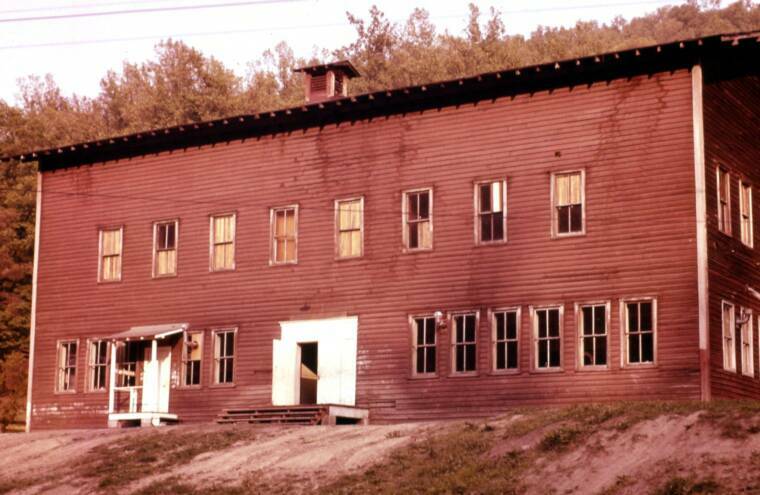 According to Patsy Baughman, the gym was on the second floor and the school classrooms wer on the first floor. Patsy points out that there wasn't a car road in front of the building during the ERC&L years where the white car visible to the left of the building appears to be sitting. The railroad runs beyond where the car is. The photo below right is Elvin Frame's house. This crystyal clear photograph is from the collection of Elvin Frame. It shows the first three houses down from the company store. Ed Currence' house is just visible through the trees above the first house. According to Patsy Baughman, the first house was the doctor's house at one point. It was slightly larger than the other homes. According to Elvin, there were as many as 60 houses in Swandale. 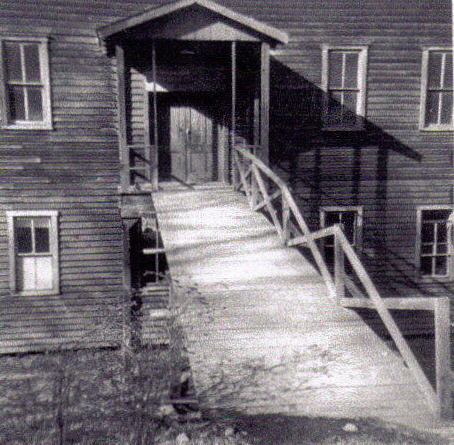 This undated photo from the Loretta Johnson Sample collection shows some additional detail of the ramp over to the Community Building. "The Swandale houses were very well built. Some were a bit larger than others and a few were two story houses. The interiors of the houses were tongue-in-groove hardwood. This would bring a handsome price on today's market. Each house had a double fire place serving two rooms. The yards were spacious enough to grow a large garden and most (residents) had a pig to slaughter each fall. Some kept chickens and the clarion call of the rooster was heard each morning as he greeted a new day. About a third of the people had a cow or two and the rest got milk from the dairy at Cressmont. There was plenty of grass for them to graze on in the summer. The terrain was hilly and most houses were built up with steps leading from the boardwalk up to the houses." "The company houses were well kept and a maintenance cre repaired anything that was out of order. They were called the "Bird Gang" and Bud Barnett was the Foreman. I'm not sure, but the company may have owned the cook stoves. They all looked pretty much alike. Each home had a privy ou back. Some had indoor plumbing, but that was at the expense of the leasee. I think the rent on each house was about three or four dollars per month. My father and Bill Ramsey found a spring up back of our house and enlarged it. They bought pipe and brought the spring water into the two houses." 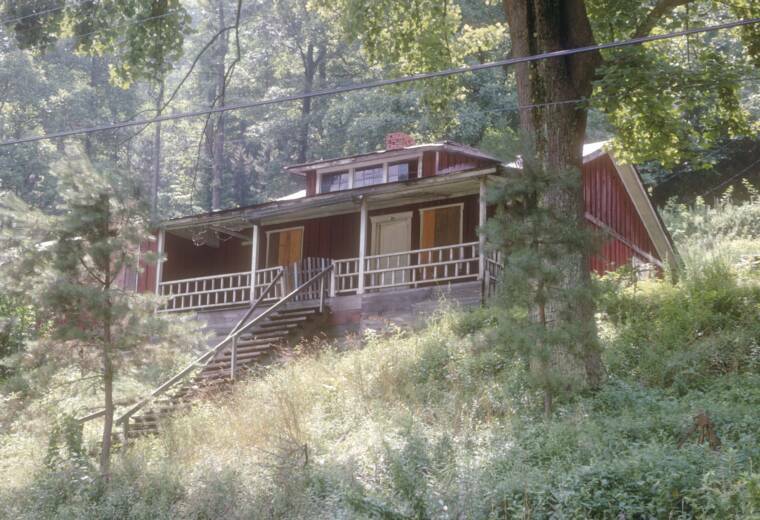 John Phillips has provided this rare color photograph of the Swandale Community building taken in June of 1963. Patsy Baughman reports that besides the classrooms on the first floor and the gym on the second floor, other activities conducted here included church, movies, holiday parties and community meetings. These four photos by John Phillips show the complete engine house as it appeared in October of 1958 before it was enclosed. Shay #12 is under the shed with #19 nearest the camera. Derelict Climax #2 is in the distance. That's Cody Burdette's green Chevy pickup.How great of John to get photos from all angles, including the interior! 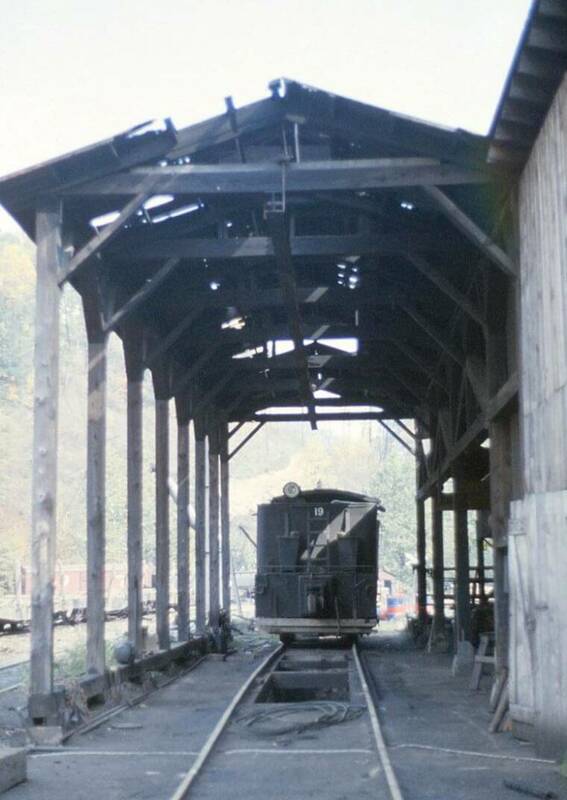 This photo shows not only the shed at one end of the engine house and a nice clear view of the 'backside' of Shay #19, but three other notable details, as well. 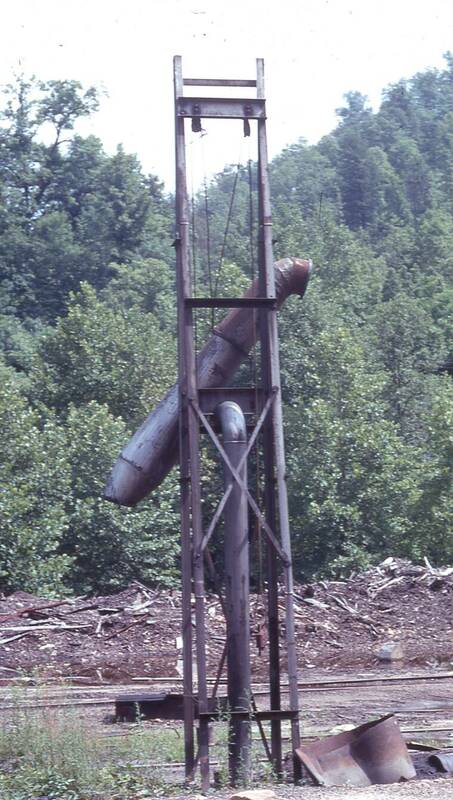 First, up on the hillside can be seen a steel water tank that fed the waterpipe. This is the only photo it's appeared in. Second, there's a nice view of the building that became the Post Office (see below, this page). Lastly just visible in front of the engine is the two-tone green 1947 Chevy of Theodore Burdette. Cody reports that he kept it shined for his dad and got to drive it quite a bit! Cody Burdette believes the man working on #19 in the photo above is Creed Truman. Creed and Cody's dad, Theodore, would work on the engine on Saturday and Sunday if they were having trouble so the train could run on Monday. Cody recalls firing #19 many, many times in exactly this spot. 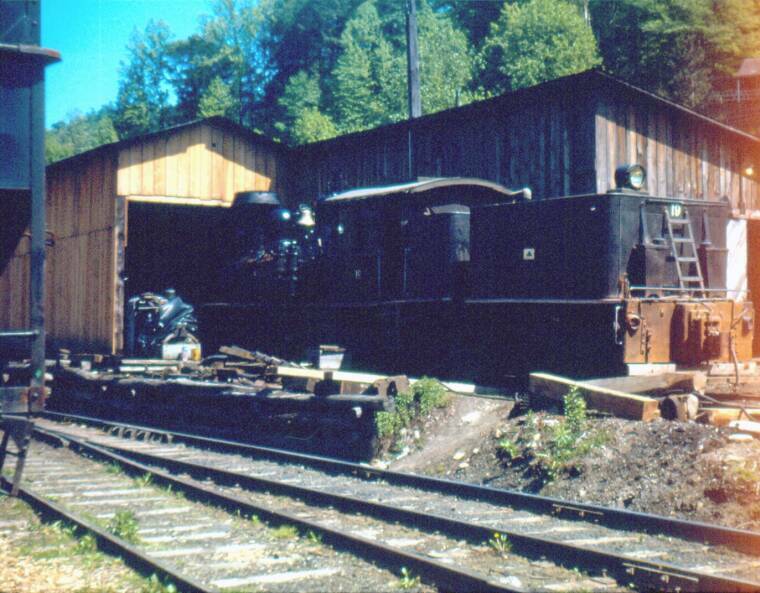 He would carry wood from the planing mill to this shed and then put it in the engine. He would light the fire around midnight, then between making rounds to the inspection boxes of the mill he would sit in his pickup truck and listen to the Grand Ole Opry. Cody recalls thinking that Nashville, TN was in a foreign country. 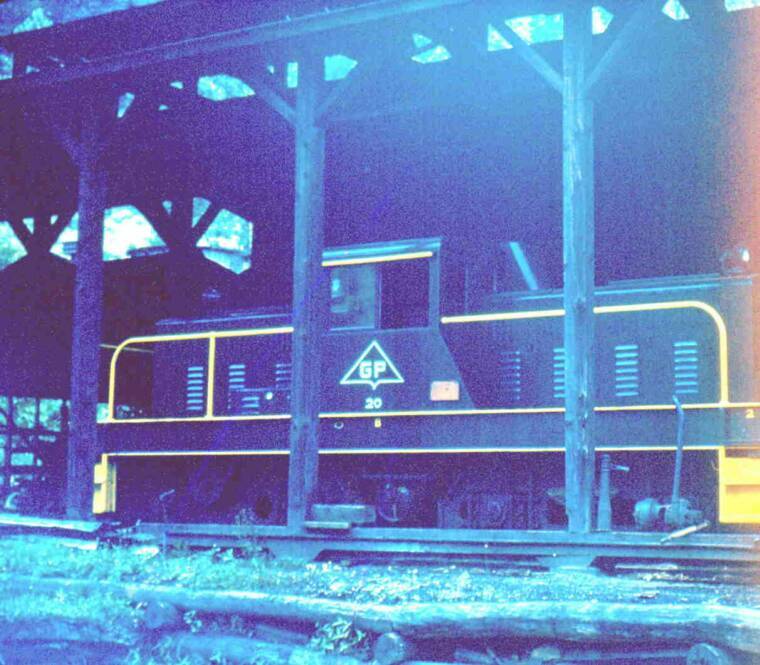 The photo above was taken by Bob Amon and clearly shows the engine house shortly after the main portion had received it's exterior siding. Notice that the shed at the rear appears to have been enclosed earlier based on the level of weathering on that portion. The date on the slide frame of this image is August 1963. 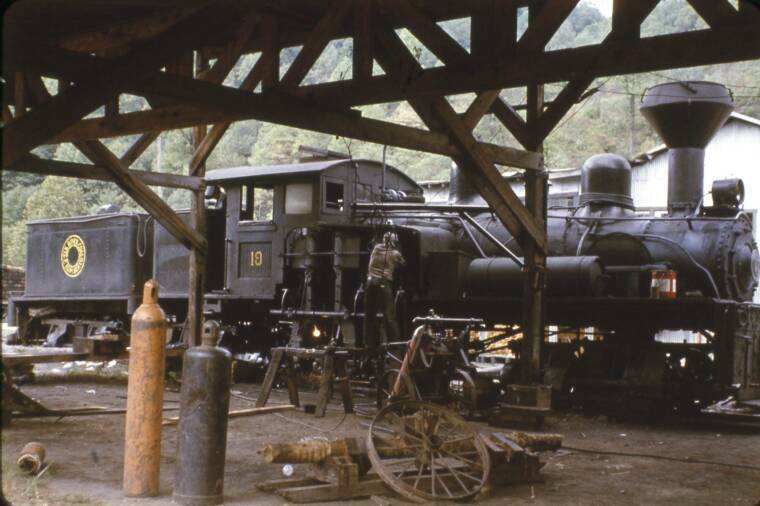 The photo to the right by Robert Amon taken in July 1962 shows the then new GP #20 sitting in the unenclosed engine house. Here's one of those great photos that modelers love! 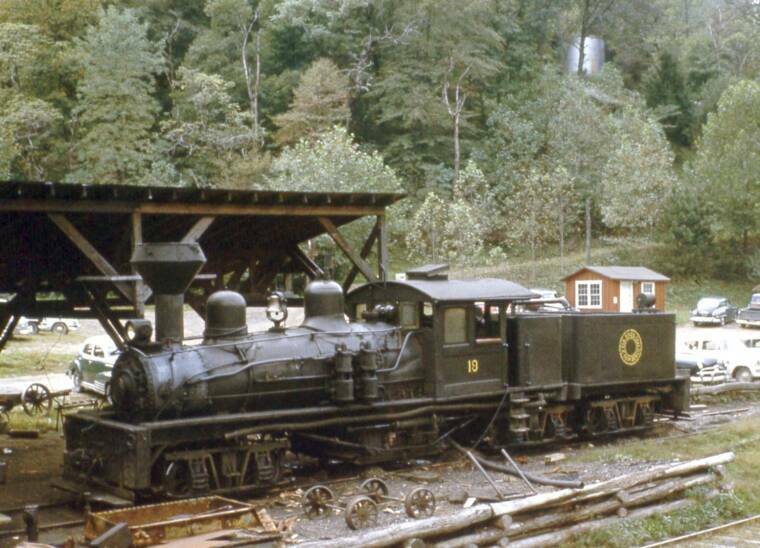 It was taken by Doug Wingfield in October of 1962 and shows two features of the enginehouse not previously visible. The first is the in-ground service pit and the secont is what appears to be a overhead beam for a chain-fall. 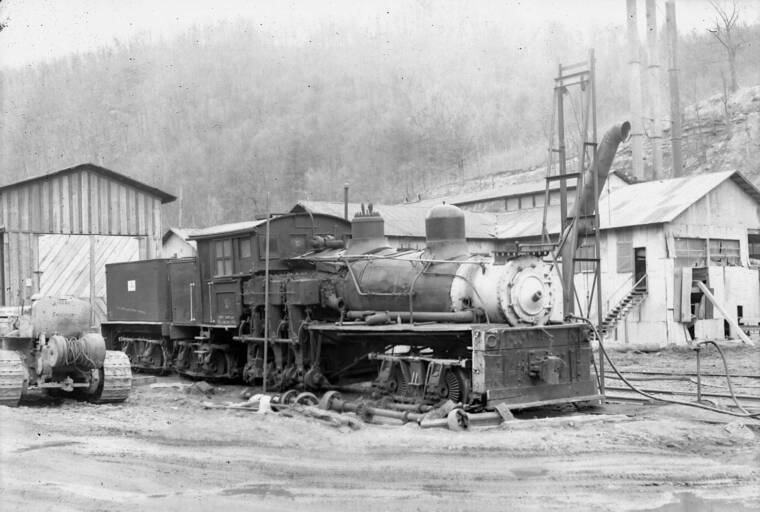 These two photos were taken by Richard Carter and are from the collection of Artie Barkley, an employee at Cass Scenic Railway. They offer good views of the enclosed engine house, although admittedly it's hard to look at the forelorn #19.